Extra-large and flaky wild-caught Haddock fillets. 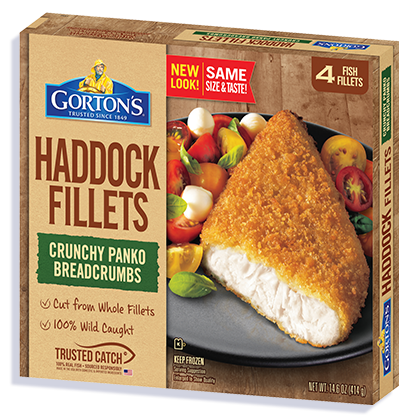 Ever flaky and always flavorful, Premium Haddock Fillets are coated with breadcrumbs made from daily baked bread for an extra satisfying crunch. With a cook time under 25 minutes, it’s hard not to get hooked. 3. Bake 22-24 minutes total. * Flip after 12 minutes. INGREDIENTS: Haddock fillets, breadcrumb coating, vegetable oil. Haddock, sodium tripolyphosphate (to retain fish moisture).